BrainPulse offers robust dedicated email servers and SMTP Relay services to run email marketing campaigns. Free installation and setup with additional mass mailing utilities. Brainpulse offers an extensive range of dedicated bulk mailing servers to allow businesses send bulk email communication to create better audience outreach. If uninterrupted delivery of your bulk email marketing campaigns is your end goal, our bulk mailing SMTP servers are for you. They not only help you skyrocket your inbox mail deliverability, but also give you deeper insight of your email campaigns via in-built advanced analytic tools. 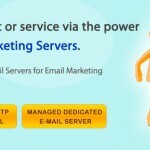 If you’re looking to deliver high volume email messages, you need a dedicated email server. Using dedicated mailing servers for bulk mailing campaigns guarantees the best delivery rate and adds another layer of effectiveness to email campaigns. Brainpulse’s Enterprise Dedicated Email Server Hosting is a fully secured, robust mail server backed by advanced spam control and anti-virus scanning features. It offers support for all major protocols such as POP3, SMTP, and IMAP etc. Our dedicated email server hosting is powered by Arrow Server Platform and allows you run your mail server hosting both in dedicated and cloud server environments. We have affordable dedicated bulk mailing servers plans specially designed for the businesses like you. Give us a call or drop us a mail, we will be more than happy to help you.